Tentipi Nordic tents are high quality, heavy duty tents perfect for adventure camping. Fitted with sophisticated ventilation feature, high performance lightweight yet tough tent fabric and weighing a mere 8 pounds (3.5 kg) for 6 people!, you can go mountain climbing, hunting, fishing or just backpacking in the nearby national parks. 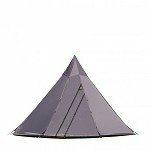 These single center post Nordic tipis are perfect for all-year-round camping even under the harshest conditions. Bengt Grahn is the owner and founder of these quality Tentipi tents originating from the Swedish Lapland . There are the Tentipi Nordic single pole adventure series, Tentipi Nordic Classic with its wooden pole just like the olden days and the large Tentipi Nordic Event series. Mansfield Outdoors is the sole distributor of the Nordic tipi tents in the northern USA and only available online. The adventure series are manufactured in China. Going by the name of Safir, Zirkon and Onyx, these tents are named after tough, rare precious minerals found in the earth. In their factory, every fifth tent is tested for its ability to withstand the elements. The tents’ lightweight fabrics are carefully controlled for water leakage. Breathable cotton/polyesther fabrics keep out the moisture condensation as well as the rain. Modern in design yet having the traditional feel, these tents are highly portable. The typical Nordic tipi has a round shape with a wide base and a fire right in the center. The great height at the center is specially designed for the smoke from the fire to rise and escape through the opening right at the top. The lighter warm smoky air rises and is replaced by the heavier, colder smoke-free air from the base. The height is just perfect for removal of smoke as well as prevention of toppling during thunderstorm; the award winning design. What is camping without a campfire. With the Tentipi tents, you can stay warm and cozy with the campfire inside the tent! This is made possible by the innovative design of the stove and chimney opening. Do not let the weather spoil your campfire games and fun as well as the delicious food. Warm humid air? The fire as well as the breathable tent fabric keep the humidity low for a more pleasant and comfortable camping experience. Camping in the desert under hot weather? The height of the tent coupled with the large air intake at the base create optimum ventilation and air flow. Breathable cotton/polyester keeps the internal tent temperature down when the days are hot. Stormy weather will see you enjoying yourself around the fire without any fear of the tent being blown away. With its symmetrical shape, stretched seams that do not break and reinforcements at the bottom of the tent, feel safe and snug singing around the campfire instead. The best part is the fire inside the tent, whether from an open fire or the stove. There are so many uses of this fire. It keeps you warm, dry your clothes, cook food, lights up the tent besides giving a warm and cozy feel under any type of weather conditions. The ventilation opening at the top can be adjusted for size and direction from right inside the tent itself through a simple system of pulling draw cords. You get to maximize the control of the air flow and smoke control, and thus the heat and coldness inside the tent. The height of the tipi tents allow for hot air to rise and the ventilation openings at the bottom of the tent allow cool air to flow in. This creates the situation of a strong airflow whereby cold air pushes the lighter warm air to rise faster and flow out of the tent opening at the top. The inside of the tent stays cool. The single central pole is a strong five-piece hardened (Safir/Zirkon) aluminium alloy pole. Hardened alloy is 3 times stronger than ordinary aluminum. It consist of inserted pipe joints which is stronger than contracted joints. Tent Fabric Onyx cp - Highly breathable and strong 50/50 cotton/polyester fabric. The tightly woven fabric and high class impregnation gives high water repellency. The fabric is grey and non breathable. Zirkon cp - Highly breathable and strong 50/50 cotton/polyester fabric. The tightly woven fabric and high class impregnation gives high water repellency. Lightweight ripstop polyamide fabric. UV-protected and silicone-coated on both sides. A carefully chosen, light and very fine standard fabric. The fabric is rust red and non breathable. Safir Light - Very light, waterproof fabric manufactured from nylon 66. Ripstop reinforced, silicone-coated on both sides and UV-protected. The fabric is green and non breathable. Floor (Pro) Optional buy Lightweight floor fabric made specifically to resist wear and penetration. For this purpose, the fabric has a relatively thick polyurethane coating. Lightweight floor fabric made specifically to resist wear and penetration. For this purpose, the fabric has a relatively thick polyurethane coating. Lightweight floor fabric made specifically to resist wear and penetration. For this purpose, the fabric has a relatively thick polyurethane coating.